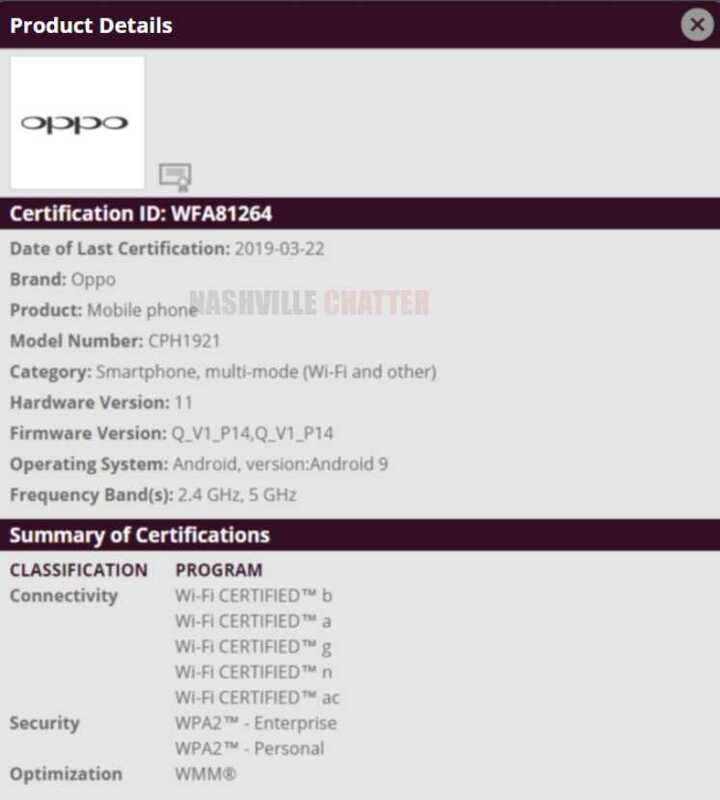 Upcoming Oppo Reno phone with model number CPH1921 has obtained a new certification from the Wi-Fi Alliance agency today. A few days ago, both 5G and non-5G variants of Oppo Reno with model numbers CPH1919 and CPH1921 respectively were certified by the Bluetooth SIG body. The Bluetooth certification page revealed several key specs of the phone and we covered the update earlier this week. The 5G version of Oppo Reno phone recently obtained 5G CE certificate issued by CTC in Europe. This certificate confirms that the phone is allowed to operate on European 5G networks. The 5G phone uses n78 band which permits upto 100 MHz of bandwidth. The Wi-Fi Alliance certification confirms that the phone will ship with Android 9 Pie OS out of the box. Oppo Reno will be powered by Snapdragon 8150 chipset, which is the Snapdragon 855 SoC. The device will have a 6.65 inch display that will support full HD+ resolution. The device will have the latest ColorOS version 6.0. The phone will have triple camera setup with 48-MP main camera along with two more rear cameras with 13-MP and 8-MP resolution. The front camera will be 16-MP. The unique aspect of Oppo Reno will be the 10x zoom camera which everyone is looking forward to. The phone was teased by the VP of the company, which hinted at 93.1 percent screen to body ratio and the weibo post also confirmed that there won’t be any holes in the display. In addition to the 5G variant, there will also be a normal 4G variant and a Lamborghini variant of Oppo Reno. Oppo Reno will come with several memory variants including 8 GB, 10 GB and 12 GB, depending up on the type of the device. The internal storage capacity will be 256 GB. The base variant with model number CPH1917 is expected to have a 4065 mAh battery whereas the 5G variant CPH1921 is expected to have 5000 mAh battery. The price of Oppo Reno would is expected to vary from $550 to $1500 depending on the model and storage variants. Oppo has officially confirmed that the next flagship from the company is Oppo Reno and that the device will be launched anytime in the coming weeks.